As the role of the treasurer has expanded in recent years, the idea of a deputy treasurer has been discussed extensively and the Executive Team and the Student Association Senate determined it would be invaluable for the SA to add a deputy treasurer to allow the organization to function more efficiently. When considering applications, my foremost criterion was to find a candidate who was professional and capable. Ameesh Shah’s experience as treasurer of Rice Program Council and conduct during his interview proved he was the ideal student to fill the role. 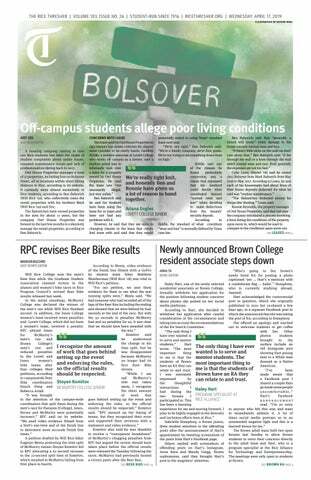 The Thresher brought up the issue of a potential conflict of interest in their editorial last week. While their concern is reasonable the SA Constitution also specifies the president shall seek to eliminate any “reasonable appearance” of a conflict of interest. A reasonable appearance should be based on a well-informed understanding of what the deputy treasurer does and what would constitute a conflict of interest. While Ameesh’s positions as treasurer of RPC may seem to create a conflict of interest, in reality there is no time where his joint holding of both positions will imperil his ability to do both jobs effectively. The deputy treasurer will be involved in the creation and management of the SA budget, sit on the Blanket Tax Committee as a nonvoting member and aid the treasurer in performing tasks such as getting food for SA Senate meetings. Therefore, Ameesh would only encounter a conflict of interest while serving on the Blanket Tax Committee. However, my standard for the deputy treasurer will be the same as for the rest of the committee in that they recuse themselves when we discuss an organization in which they are directly involved in as an officer or active member. This standard, as laid out in the SA Constitution in section X.B.6.f., will prevent even the appearance of a conflict of interest. While I understand the Thresher’s concern about the creation of a “leadership pipeline”, my goal is not to feed into or dismantle such a system. My foremost concern was picking the candidate best-suited to aid the Student Association immediately. Ameesh’s experience and professionalism made him a clear choice for the position. In addition, I offered three of the candidates who were not selected the opportunity to serve on the Student Activities President’s Programming committee to give them another avenue to get involved in campus decision making. It’s important to make clear that leadership isn’t a quality distinguished by title or position but by action. Any student with a vision or plan to improve our campus will be supported and empowered by the SA to be a leader. The ability of the Student Association to empower and represent students effectively is however predicated on a well-run and effective executive branch. The Senate approved Ameesh to serve as deputy treasurer after they understood how qualified and competent of a candidate he is and we look forward to welcoming to him to our team.